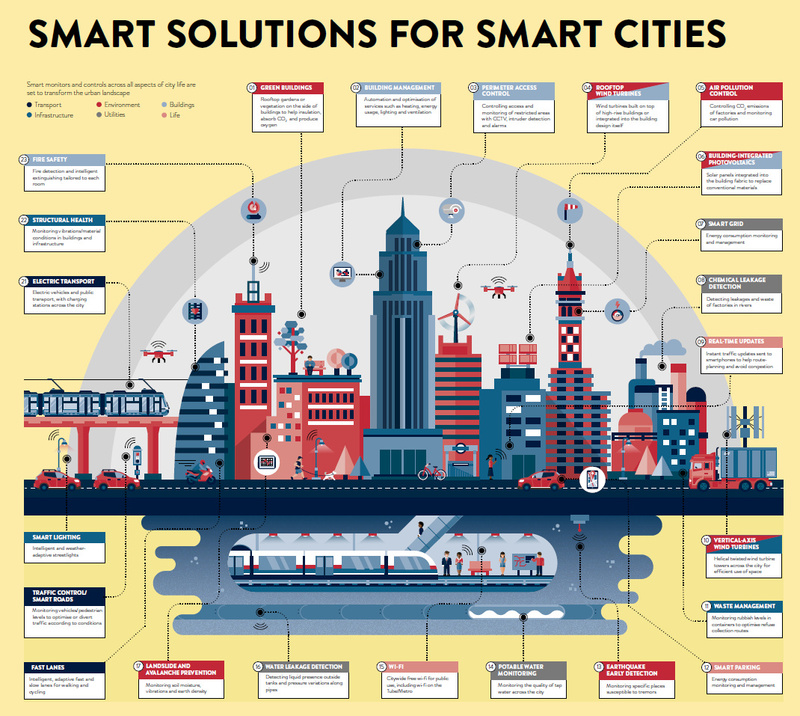 The smart city agenda — pushing cities to use technology to better integrate their communicative, physical and digital infrastructure — offers risks as well as convenience. A new report considers two big risks: will the physical infrastructure meet the demand for electric vehicles, and how fairly is the roll-out of improvements shared with all citizens of a local society. Ryota Matsumoto's mixed media creations are a commentary on ever-evolving urban milieus. 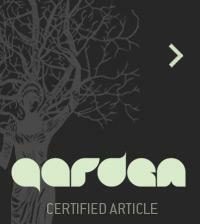 See his articles in these pages. JWC: What are the key potential problems you are addressing in your report 'Smart Cities: Fair Investment for Sustainable Growth'? JOE FYANS: The report is intended as a response to the ‘smart cities’ agenda, with the key problem addressed being: as we move away from fossil fuels and towards ‘smart’ technology powered through the energy grid, what infrastructure upgrades are required? We use the example of electric vehicles and their charging equipment to illustrate how, without a coordinated strategy, more deprived areas could be left behind. To understand the potential positive impact of your report, what could occur if the report's recommendations were completely ignored? Left to the market alone, a situation may arise where infrastructure for smart technology (local power grid upgrades to cope with extra demand, charging points for electric vehicles) are placed primarily in places where people already have the means to buy this technology. This could create a cycle where subsequent investment in infrastructure is then poured into these wealthier areas, even as smart technology itself becomes more affordable. So we risk a tale of two cities within our cities. What is at the crux of strategic planning inadequancies in the UK that necessitate this particular focus on risks? Coordination is the main problem. When you’re looking at an innovation of the kind required to make a truly ‘smart city’, you need cooperation across the transport network, the energy network, the communications network and of course citizens and their representatives. It is undeniably challenging but to achieve genuine integration of functions there needs to be concerted action towards defined goals. 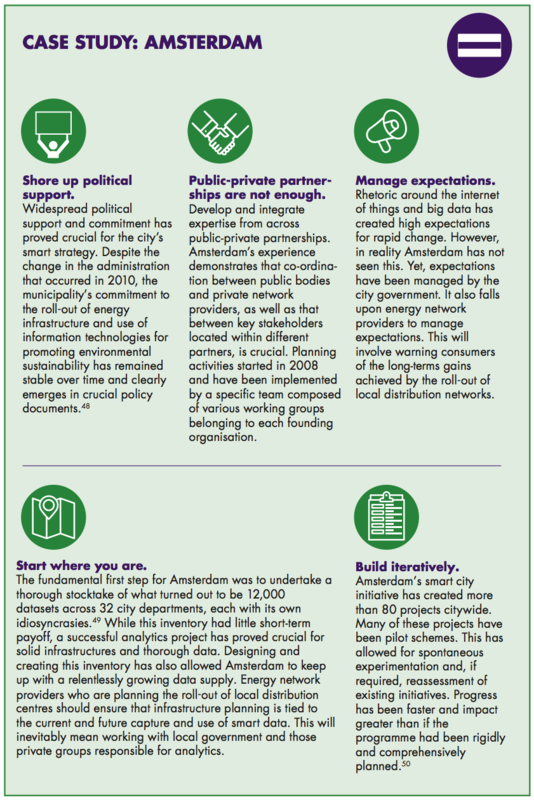 As we move away from carbon-based district heating, similar upgrades to infrastructure and strategy will be required. Perhaps the UK is in step, behind or ahead in its focus on what to do about technological proliferation in cities. How might you comment on what other countries like yours are doing in this area, and how the UK compares? City governments have similarities all over the world, because cities face similar issues — the recent summit of mayors in Bristol is a good example of this emerging understanding. Issues like smart cities and clean growth cry out for a neo-localist response — one which makes the most of the convening power of city governments to create broad horizontal alliances across business, the voluntary sector and across international boundaries with peers from across the world — without the intervention of the central state. By studying how to plan for cities of the future in the case of energy use for electric vehicles, what other issues have come to the forefront that are part of what needs to be addressed? We realised quite quickly that EVs are in many ways analogous to the smart agenda as a whole. It comes down to our ability to understand better the ebbs and flows of our energy usage and plan accordingly. EVs are a good example because the infrastructure they require is very visible and the technological change underpinning them is very clear: we all know what the chargers are, and we all know how different they are as vehicles from internal combustion engines. The basic point, though — that we need to start having a more intelligent view of the data we generate through an increasingly tactile power network and that we need to plan carefully to ensure full and fair coverage — is a broader argument. As we move away from carbon-based district heating, for example, similar upgrades to infrastructure will be required and the same argument for strategy will be applicable. How is the ‘fairness’ quotient addressed in your report, in terms of those without the economic means to be part of these sustainability goals? There are three key issues with fairness where the use of smart technology to improve sustainability is concerned: firstly, lack of investment in visible smart infrastructure in deprived areas could discourage and slow down the uptake of electric vehicles, which is of course an environmental imperative. Secondly, the benefits of a smart city – with integrated physical and digital infrastructure – depend on a ‘network effect’: it is hard to intelligently allocate electricity based on information generated from the smart grid if the coverage of that information is incomplete. Finally, at the most basic level, due to infrastructure upgrade work being priced into energy bills, the cost is already socialised – the benefits therefore must also be felt across society. What will the next important issues be — ones that we have to deal with in relation to creating smart city infrastructure? The aforementioned move towards new heating systems – whether they are hydrogen, electric or even heat pump – will be a logistic challenge. Unifying transport networks is also important in many UK cities – London already has this via the Oyster Card but many cities still have multiple different ticketing and monitoring systems on bus networks alone. What is Localis, what is its scope of work address and might companies like it be part of positive societal change? Localis is a leading, independent not-for-profit think tank. We work to promote neo-localist ideas through research, events and commentary. Neo-localism is about giving places and people more control over the effects of globalisation. It is is worried by economic prosperity, but also seeks to enhance other aspects of people’s lives, such as family and culture. Neo-localism is not anti-globalisation, but wants to bend the mainstream of social and economic policy so that place is put at the centre of political thinking. • Reshaping our economy. How places can take control of their economies and drive local growth. • Culture, tradition and beauty. Crafting policy to help our heritage, physical environment and cultural life continue to enrich our lives. • Reforming public services. Ideas to help save the public services and institutions upon which many in society depend. • Improving family life. Fresh thinking to ensure the UK remains one of the most family friendly places in the world. If you were to meet with city councillors in countries in a relatively similar state of progress as the UK, how would you encourage them to structure their thinking about the urban future? JOE FYANS is a researcher and statistician, and Head of Data Research at Localis. His interests are in creating public policy to promote a globalisation process that is responsible both culturally and ecologically. His work on local labour markets has been featured in the Financial Times, The Guardian and on Sky News. He lives in South East London.